I really love the fact that more and more members of toool get involved to the point they single handedly can perform crucial tasks. In this case Jos Weyers took care of this year’s lockpick competition. And one of the things he did was photograph all locks in high detail (images at the bottom of this post) …. For those unfamiliar with the Toool competition, here is a small explanation: the competition starts and ends at every LockCon/Dutch Open event. So in this case we just started a new competition. We start with inviting people to donate special and exotic locks, and make a selection of 26 of the most interesting ones. As soon as this selection is done, all locks will be photographed and a competition webpage is set up (link to 2008, work in progress). Now the fun starts: At every Toool meeting (in Amsterdam and Eindhoven), members can try to open these locks, and keep track of their own time! After each club evening the scores are collected and the webpage with the scores is updated. You will receive ten points for being the fastest to open a lock, the second best will get nine points etcetera etcetera till number ten who will receive one point. Number eleven to open the lock will not get any points… Now all points for all locks will be added up and the person with most point wins. I have won this competition multiple times, but since I was too busy learning other lock opening skills I neglected picking a bit and last year did not even made it into the top three. I am not sure if I will join full force this year, or if my new lock opening passion will take all of my time. What I do know is that there is a lot of manufacturers out there that keep an eye on this blog to see if their lock is mentioned. 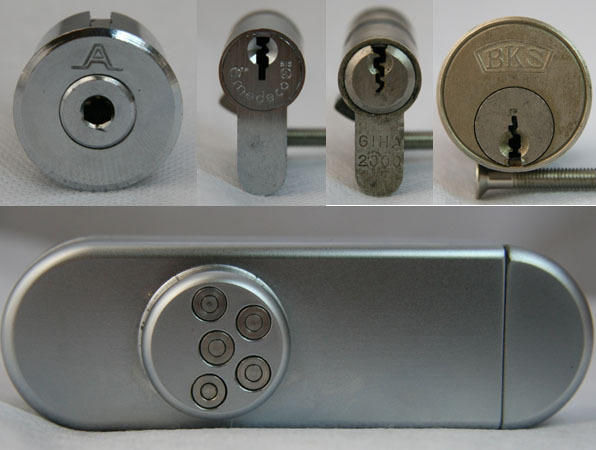 Here is the list of locks in this years competition (click on the name of the lock for a close up): chinese lock with pins from three sides, Mul-T-Lock MT5+, no name, Tesa 5-pin, Fixit, Iseo 5-pin, 2001 (Buva? ), Iseo 6-pin dimple, Abus, Lips, Corbin, Nemef, Giha 2000, Medeco Bi-Axial 6 pin (with correct side-bar Ã¢â‚¬â„¢set keyÃ¢â‚¬â„¢), Nemef, Oxlock, Ikon sperr rippen, Unknown (from SSDeV), GTV, Winkhaus, Yale, AGB, BKS, UCEM (Spain), BKS and … a Gemini shield! If the new site is up where we keep track of times I will post the address here so you can keep track of our progress …. This entry was posted on Monday, November 17th, 2008 at 02:16 and is filed under Uncategorized. You can follow any responses to this entry through the RSS 2.0 feed. You can leave a response, or trackback from your own site. The Unknown lock from SSDEV appears to have a Schlage SC1 keyway, but that’s a common keyway in the US so it could be made by anyone. Hi, recently I’ve got a catalogue of the company Mauer Locking Systems, it seems to be considerable company in central-east Europe. Anyway, from here and there I understood that they are developed one very special lock, named NW4. I saw some brief info in their website: http://www.mauerlocks-bg.com/index.php?ch=3&tr=3&id=125&lang=en. I’d like to have this in my hands, but have not seen anywhere till now.